"Amodal Suspension was a large-scale interactive installation developed for the opening of the new Yamaguchi Center for Arts and Media (YCAM) in Japan. From the 1st to the 24th of November 2003 people could use this website to send short text messages to each other using a cell phone or web browser. 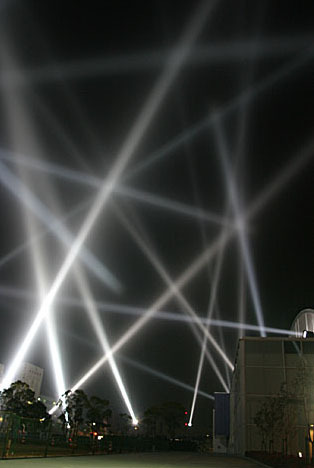 However, rather than being sent directly, the messages were encoded as unique sequences of flashes with 20 robotically-controlled searchlights, turning the sky around the YCAM Center into a giant communication switchboard. The project received over 400,000 unique visitors from 94 countries (79 per cent from Japan). Visitors requested over 6.3 million server documents, sent almost 10,000 messages and downloaded over 50 Gigabytes of data while the project was live. See a short video on the project. View the mesh of light from eight webcams located around the site. All messages were stored here once they were caught and read.